Simply put it's unrealistic for a decent mmo to come out of a tiny budget. 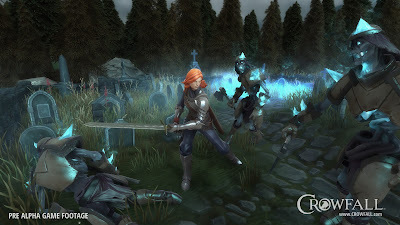 It doesn't matter how skilled some of the team are or their history, the size of the team is just as important and one thing I notice with these studios such as ACE(Crowfall) and CSE(Camelot unchained) is they are way behind on their roadmap due to a small team size directly related to budget. I backed a fairl hefty pledge on crowfalls Kickstarter but recently I've realised they simply won't be capable of delivering what they envisioned. They have had to cut corners by using a shoddy engine incapable of running an mmo at the scale they promise. Similarly I backed Camelot unchained and again I've seen huge flaws in their progress. Although they have developed a somewhat impressive engine they are lacking in just about every other area. Both games suffer greatly from the "founder" issue where they sell ridiculous perks for real money in order to sucker people in. If you are one of the unfortunate plebs who decides to purchase later you get less and pay more which is the reverse of AAA games that lower their price over time and often throw in expansion packs etc. Ultimately this new age of crowd funded mmo is a farce and as of writing no good mmo has been developed as a result of it. I hope AAA studios regain confidence in the mmo market or seek to innovate in the field. I personally prefer a polished title backed by a large and proven team as opposed to a project of love that despite having the best intentions will never have the raw infrastructure required to develop a top notch mmo. Say what you will about the big AAA mmos of the last 5 years, but they all have healthy communities and player bases and satisfy their niche. The good news is I sold both my early Kickstarter packages for a healthy profit when I stopped drinking the KOOL aid after playing the alphas and seeing the decision and struggles of the developers.